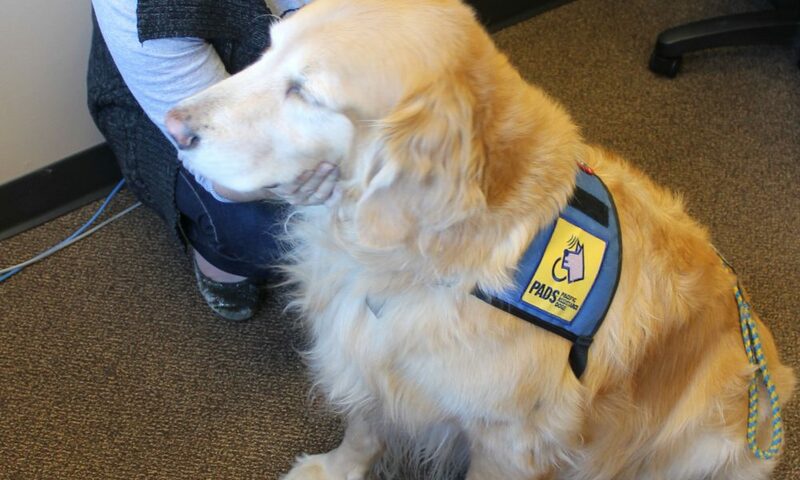 The 15 year-old golden retriever is the Pacific Assistance Dog Society’s (PADS) longest serving member and has worked alongside registered clinical counsellor Dawn Holt in the UFV counselling department for nearly all of her career. Mac was the first registered therapy dog in the world to work with a counsellor in a non-residential setting. He was the first to work full-time in a hospice environment and the first to work as an on-staff therapy dog with university students. Mac has been a ground-breaking service dog for his entire career. He has helped students during exam time, calmed those in crisis, consoled police officers during funerals, and helped wild fire victims. With Holt he has worked with students and others in counselling sessions, critical incidents, in classrooms, hallways, offices, and at hospices. Over the course of his career, the canine counsellor has made 1792 drop-in visits, participated in 6187 counselling sessions, and appeared in over 12,000 meet and greets in gyms, arenas, and events. He has been a key part of 635 intensive therapy sessions, and 12 critical incident and disaster relief deployments. “I’m just so grateful he has been able to work for so long – and still loves it! He beats me to the car for the commute most mornings,” says Holt. He has been awarded the BC Provincial Above and Beyond certificate for selflessness in service for his deployment to assist BC wildfire victims in 2017. He has provided support for community and police agencies after critical incidents and facilitated mental health workshops. Mac now sheds the blue and yellow PADS vest and this allows him to really start enjoying his “golden” years with fewer responsibilities and rules. “He knows he doesn’t have to be on his absolute best behaviour when he’s not wearing the PADS vest, so now he’s doing some things he would normally only do when ‘off-duty’; he is already starting to relax and enjoy his retirement,” Holt says. Mac will continue to come to UFV, but now as a volunteer, rather than as a registered professional. For Mac it’s likely going to be business as usual as he provides a quiet, calming, and helping presence for those in need of unconditional support.